You have to use Gparted, the Windows installer or the Ubuntu installer for partitioning. The EXT4 partitions can not be done with Windows. You should leave it to NTFS and then to install Ubuntu Mate change to EXT4. Gb enough if I install VirtualBox and add Windows and programs. Then we have the three most important partitions, where everything is saved and never changed, these partitions made in NTFS, for access from Ubuntu Mate and Windows XP. 5th MUSIC, NTFS, here keep stored music, almost everything on MP3. 6th DATA, NTFS, here keep everything related photos, documents and programs. 7th VIDEOS in NTFS, here keep downloaded movies or recorded with Kaffeine. It's good because you only open the partition you need, there are days that do not open those partitions, the amount depending on the use, by doing this improvement in performance when searching folders, improved battery consumption (laptops), improved duration of hard drive . when I change my OS, I just made the changes to the partition 3 and 4, everything else remains the same, do not touch. 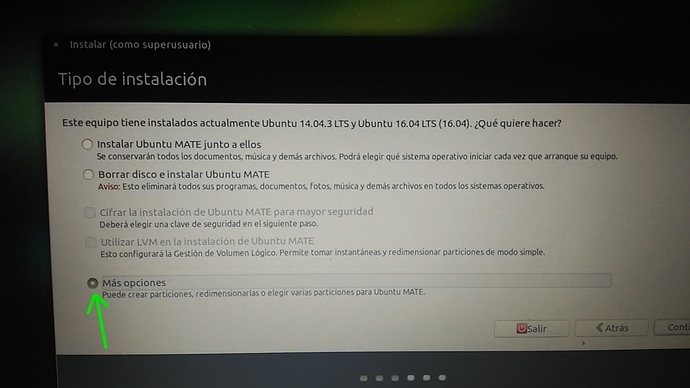 I installed 4 versions of Molinux, 2 Lliurex, 2 Linux Mint, Ubuntu 3 being the last Ubuntu 14.04 and now use Ubuntu Mate 16.04 (hopefully long). I have not touched the other partitions and have never lost saved data, without using any program to Back up. always do clean install of Ubuntu, I think it is best a new installation, you avoid accidental changing of settings and other additional problems at update. But it is always good to have an external hard drive where you save the most important files on the partition of Music, data and video, because hard drives using always end failing. That’s cool information and all, but you couldn’t like, use mate-screenshot to make the image of ubiquity? Slightly confused about that. Lots of people have difficulty with partitions, since that’s often advanced stuff nobody gets into despite the fact knowledge about them and what can be done with them is super-beneficial. I often bring up my USB-connected setup of a hard disk with NTFS partition so I can use any Linux session to manipulate files in that NTFS partition, auto-mount it on the Linux system installed at the bigger of the two Ext4 partitions I have and have the most used and most space-demanding of folders in $HOME be there, linked into the Ext4 partition so I can keep file paths tidy and manipulate files on Windows or Mac OS X systems with Paragon NTFS installed in forum threads like these but I also did my own writeup about that on here in the hopes random people find it and find it usable. Just wanted to mention that in that setup (in which I would prefer GPT instead of MBR but that is not viable because XP doesn’t recognize it) is nice to label the ntfs partition as you did because you can see the name as if it were a folder and also it helps on having less fragmentation. Nevertheless, it may have an impact because (let’s suppose) if you want to copy a discography to an USB + watch a movie the head moves from one place to a (possibly far) other of the HDD to do the reads, increasing seek time. Thanks for this great tutorial Wolfman, he is very extensive and better explained. The important thing is that people who do not know, understand how it is done and why it does so.